This like-new, professionally-decorated condo is designed for the ultimate family vacation. At almost 2,000 sq ft, this 3 bedroom, 4 bathroom unit is set up to sleep up to 10 people (all in bedrooms without the need for pull-outs). There are 2 master bedrooms with king beds. The third bedroom includes a queen bed and 2 stacks of bunks (4 twins), ideal for 2 families with 6 kids. The beautiful dining room table comfortably sits 10. For those who love to cook, the kitchen includes all stainless steel appliances and is fully-equipped (including a Keurig, coffee pot, blender, crock pot, and hot air popcorn popper). The wet bar includes a commercial ice maker. There is a 47” flat screen TV in the living room, 26” flat screens in the 2 master bedrooms, and a 32' TV and bluray player with free Netflix access in the bunk room; Netflix access is also available in the living room. Along with two chaise lounges, an additional table with seating for eight is provided on the spacious patio. The gulf views are absolutely spectacular. You have to see it to believe it. 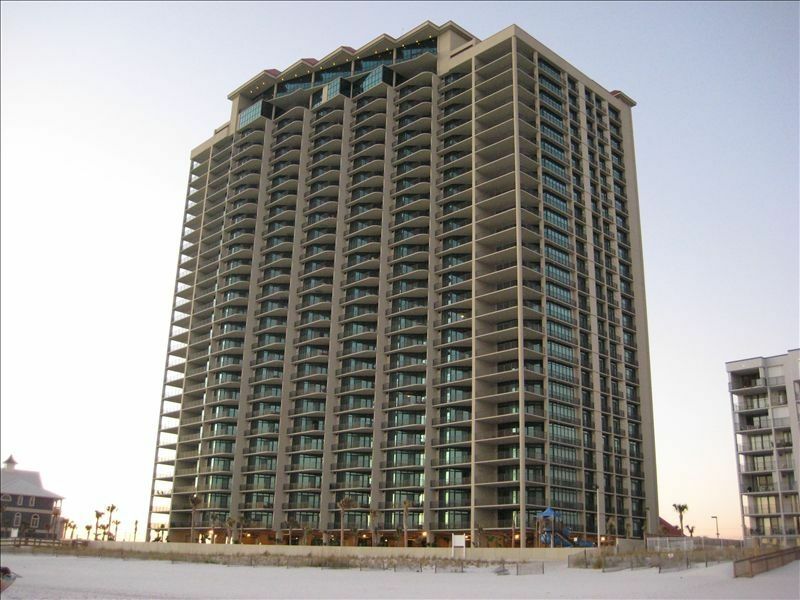 The 4th floor location creates a beautiful view of the beach & gulf. It overlooks the outdoor pool area closer to the water slide. Parents can watch their kids on the beach or at the pools from the balcony. This low floor also allows for indoor parking on the same level without waiting for elevators. The utility room is furnished with a full-size washer and dryer as well as an iron and drying rack for wet suits and towels. Also for the convenience of new parents, a high chair and a pack-n-play are available for use and stored in the master bedroom closet. Without question, Phoenix West is one of the nicest condos on the beach. The outdoor amenities include a lazy river, an awesome water slide, a zero entry pool and a gated kiddie pool. In addition, there is a large heated indoor pool with 2 hot tubs, a state-of-the-art work-out room and a tennis court. The lobby offers a one-of-a-kind, dramatic 27-story atrium. This is the finest building ever constructed by Brett Robinson!! We benchmark our rental rates to be 10-15% cheaper than Brett Robinson or Kaiser, and we are set up to sleep 2-4 more people than a comparable 3 bedroom. Spacious condo, lovely deck, well kept facility. Super nice condo, every amenity you could want and more! Owner kept in contact with us prior and upon arrival to make sure we had all we needed and condo was clean! It was wonderful. Definitely hope to go back next year! The owners communicated well and were a pleasure to deal with. The condo was great!! Very clean and well kept. Would stay again. Pros: This was our second stay in the condo. Plenty of room for our party of 8. Beautiful location, sits perfectly on the 4th floor above the palm trees. Easy access from the parking garage. Tennis is located on the 9th floor, tennis rackets and balls are provided at front desk. Cons: The oven does not heat up as it should, it took double or triple the amount of time to cook anything. The freezer leaks water all over the floor if the door is not given a good push when shutting. I’m sorry you experienced problems with the oven. We were there at the end of September and didn’t experience any problems. We will certainly keep an eye on it and fix it promptly. With regard to the leak, we found the problem and fixed it when we were there the week of 9/23. Apparently a piece of frozen chicken fell down and blocked the drain hole behind the bottom drawer. The fridge door still needs a push to be closed fully as to be expected. From the second we stepped into the condo we were amazed! It was exactly as pictured and immediately felt like home. Condo seemed updated and stylish. There was plenty of space for all of us-we loved the bunk bed room and having 4 bathrooms was a huge help! Valerie was readily available to answer any questions or help point us in the right direction. It was great to form a friendly relationship with the owners. We’re aready planning a return trip for next year. Thanks for your kind review. We’d love to have you return. Please contact us if we can get you rebooked.